Click the button below to add the Apple MacBook Pro Retina 13.3-Inch Laptop (2.9 GHz Core i5, 8 GB RAM, 512 GB SSD, Force-touch) to your wish list. RARE! Upgraded 2.9Ghz Core i5 processor with 512GB Solid State Drive $1800 list! 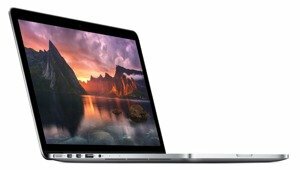 With fifth-generation Intel Core processors, the latest graphics, and faster flash storage, the incredibly advanced 13.3-inch MacBook Pro with Retina display moves even further ahead in performance and battery life. The MacBook Pro with Retina Display now features the Force Touch trackpad. The Force Touch trackpad takes all the capabilities of Multi-Touch and adds force sensors that detect subtle differences in the amount of downward pressure you apply. This lets you have a deeper connection to your content, bringing more functionality right to your fingertip. It also introduces haptic feedback to MacBook Pro - allowing you not just to see what's happening on the screen, but to feel it. Measuring a mere 0.71 inches and weighing only 3.46 pounds, the MacBook Pro sets a new standard in performance and portability for pro users. 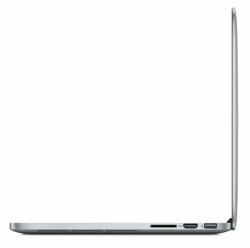 The world's highest resolution notebook display with over 4 million pixels — 2 million more than an HD television — the MacBook Pro with Retina display has such a high pixel density that the human eye cannot distinguish individual pixels from a normal viewing distance. 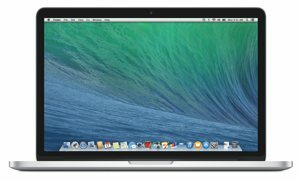 This version of the 13.3-inch MacBook Pro with Retina display (model MF841LL/A) features a fifith generation 2.9 GHz Core i5 dual-core processor, 512 GB of flash storage, and 8 GB of onboard 1866Mhz RAM. The MacBook Pro also includes two of the latest high-speed Thunderbolt 2 ports and two USB 3 ports, enabling you to easily connect to external displays and a wide variety of high performance peripherals. With up to 60 percent faster PCIe-based flash storage compared to the previous generation and new 802.11ac Wi-Fi for up to 3x faster wireless, the new MacBook Pro is quicker and more responsive than ever. You'll also get up to 10 hours of battery life while on the go. Packs over 4 million pixels into the stunning display. At over 4 million pixels (227 pixels-per-inch), the Retina display's pixel density is so high the human eye cannot distinguish individual pixels from a normal viewing distance, so text and graphics look incredibly sharp. Images take on a new level of realism and text is pin sharp. And with a 2560-by-1600 resolution, you can see more of your high-resolution images onscreen with pixel-for-pixel accuracy. You'll see fine details and textures in photos like never before, and even tell which photos are in focus just by looking at the thumbnail. The Retina display uses IPS technology for a 178-degree wide viewing angle. Since OS X is designed to take advantage of each core, the fifth-generation Intel Core i5 dual-core processor (based on the latest Haswell architecture) captures every bit of performance from the processor. When you need more power for a processor-intensive application like Aperture or Final Cut Pro, Turbo Boost 2.0 automatically increases the speed of the active cores. And by shifting core frequency in small increments, Turbo Boost allows the processor to manage performance without sacrificing efficiency. This model features a 2.9 GHz dual-core Intel Core 5 processor with Turbo Boost speeds up to 3.3 GHz. It's complemented by Intel Iris 6100 integrated graphics, which can boost performance by up to 90 percent (over the previous generation MacBook Pro with Retina display) — so it can handle both everyday tasks and graphics-intensive creative apps. Delivering an amazing 20 gigabits per second of transfer speeds in both directions, the ultrafast and ultraflexible Thunderbolt 2 ports allows you to move data up to 40 times faster than with USB 2.0 and more than 24 times faster than with FireWire 800. You can also daisy-chain up to six Thunderbolt-compatible peripherals without using a hub. Thunderbolt also supports DisplayPort for high resolution displays and works with existing adapters for HDMI, DVI, and VGA displays. 13.3-inch MacBook Pro, MagSafe 2 power adapter, AC wall plug.